Cheyenne is a bay black female that has just had her 4th cria, She would be a great female for anyone wishing to own their own alpaca farm and would like to keep the initial start-up costs relatively low. Cheyenne is a great mom that has a very easy time with her births. Cheyenne's 3rd cria, Half Moon June a white female out of Antonio's Alianza Salute, had an IgG count of over 3000. Half Moon June placed 1st in a very competitive class at the 2009 ABWNY show. Cheyenne is also the mother of our striking True Black H.Ben Nevis. Ben Nevis recently took a blue ribbon at the 2011 ABWNY show. Her last two crias are both Blue Ribbon winners. 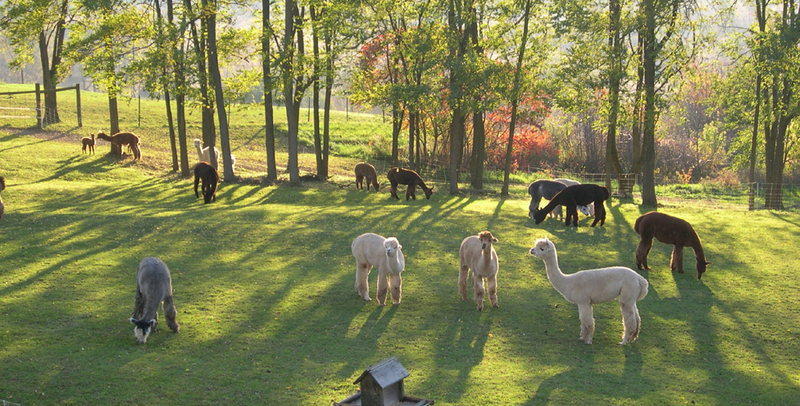 We recently purchased another farms entire herd, including Cheyenne, and are offering these alpacas at a substantial savings. We need to reduce our herd to make room for next years upcoming cria's so we are offering this female at a greatly reduced price. Cheyenne comes with a breeding to H Conrad, our Blue Ribbon winning Herdsire or Outback Alpacas Ezekiel a Blue Ribbon winning dark brown herdsire. Ezekiel is the father of Ben Nevis. Cheyenne lets the color pass through from the male she is bred to. Sandy is a large 3/4 Peruvian Male. He is an older boy that has maintained very fine nice fiber! Which has been a fleece that makes the cut for quality yarn ranking high in the "comfort factor" - Additionally, his laid-back personality with an even gentle temperament makes him a great choice to pass along those genetics. Sandy's bloodlines has proven show-ring genetics of PPeruvian Elever , PPPeruvian Whispers and 5Peruvian El Cid. This guy has incredible genetics and will bring a lot to your breeding program.